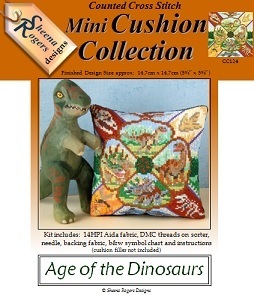 The age of the Dinosaurs has returned with this mini cushion design. Filled with creatures from the Jurassic age, this design includes a Velociraptor, a Brachiosaurus, a Triceratops and a Stegosaurus. There are fossilised bones of a skeleton and a skull, plus a mosquito trapped in amber from which the Dinosaur DNA could have been captured, plus a footprint in the ground. Beware also of the Pterodactyl swooping through the sky and the sea monster sailing through the ocean. No place is safe! Only whole cross stitch is required to stitch the design with some backstitching required for the details.